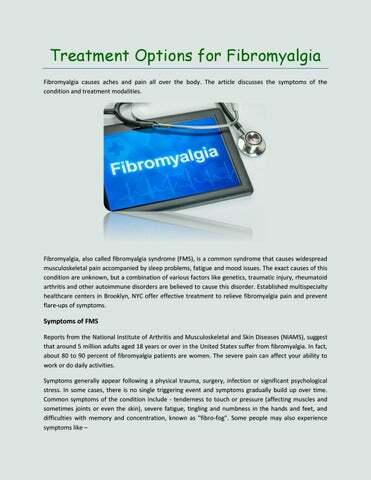 Treatment Options for Fibromyalgia Fibromyalgia causes aches and pain all over the body. The article discusses the symptoms of the condition and treatment modalities. Fibromyalgia, also called fibromyalgia syndrome (FMS), is a common syndrome that causes widespread musculoskeletal pain accompanied by sleep problems, fatigue and mood issues. The exact causes of this condition are unknown, but a combination of various factors like genetics, traumatic injury, rheumatoid arthritis and other autoimmune disorders are believed to cause this disorder. Established multispecialty healthcare centers in Brooklyn, NYC offer effective treatment to relieve fibromyalgia pain and prevent flare-ups of symptoms. and isometric exercises to reduce pain, strengthen the muscles, and enhance flexibility. ✓ Chiropractic care – Administered by trained chiropractors, chiropractic treatment involves using spinal manipulation and realignment techniques to reduce pain, improve function, and promote natural healing. low-voltage electrical simulation which interacts with the sensory nervous system to decrease muscle stiffness and pain. ✓ Pain management injections – Over-the-counter medications such as acetaminophen (Tylenol, others), ibuprofen (Advil, Motrin IB, others) or naproxen sodium (Aleve, others) can help reduce inflammation, minimize muscular aches and improve sleep quality. As FMS causes widespread muscle and joint pain, living with this condition can seriously interfere with or affect your routine activities. 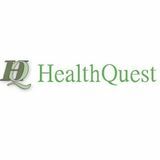 Managing these symptoms effectively helps in improving quality of life. Making small lifestyle changes such as doing moderate exercises, maintaining good sleep patterns, consuming nutrient-rich food, and reducing stress can help you better manage FMS symptoms.